"I Bought Some Antique Windows At A Flea Market. Now What?" "I recently acquired a pair of American windows circa 1920. They are in their wood frames. Is it best to leave them as is or should I remove the stained glass from the frames for aesthetic purposes. Also, is there any issue to safety in the lead as there is with old lead paint? Thank you." Congratulations on your acquisition of the antique windows. 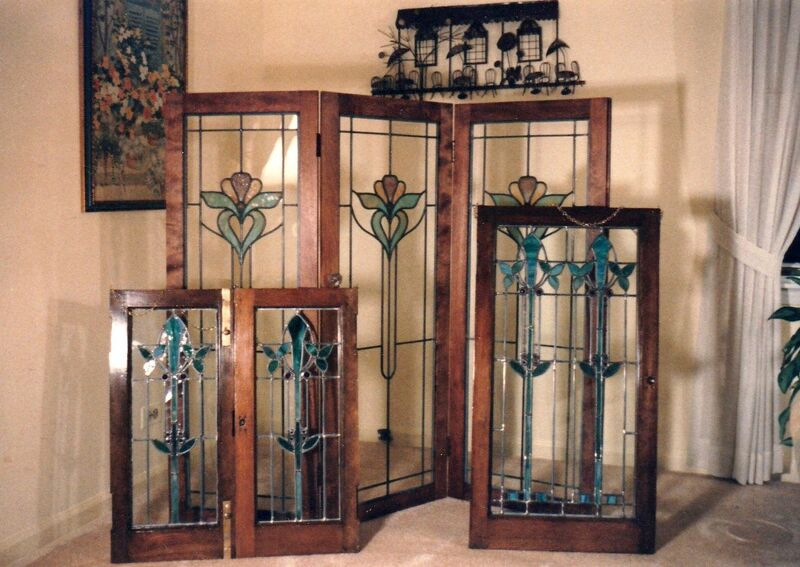 In the past clients have chosen to display their antique windows in a variety of ways. If they are distinctive works of art, they should definitely be preserved as closely as possible to their original appearance. However, lots of old glass was not particularly unique and was used primarily for decoration. Sidelights, transoms, closet windows and stairway windows are some examples. This kind of glass was commonly selected from catalogs that big stained glass studios had of their standardized products. Because of the design quality, construction, and glass used from that era, these more ordinary windows are still beautiful and fun to incorporate around the home today. If the artistic or decorative merit of the windows is high, things like cracks, missing pieces and wobbly panels should be repaired. This will conserve the windows the best and result in the best appearance. Our clients frequently display their old glass in its original sashes. They hang the entire window unit in front of another window. An option is to build it into some sort of unit and artificially light the panel. This way it can be used as a furniture panel or wall unit. Old frames are usually crusted with cracked paint or old varnish but underneath all of this they are beautiful old wood. The craze to leave the sash all weathered and scratched as shabby chic seems to be passing. Instead, people are stripping the sashes down to their bare wood which is often oak or mahogany. When refinished the natural grain and color of the wood frames combined with the old design and glass of the panel makes a lovely Arts & Crafts style piece. Stripping and refinishing the sash is easiest to do if the glass is out of it. Depending on how the panel is installed in the sash, it can be very difficult to remove. Some older windows were even designed with a plain border around them that could be easily repaired in case it was broken during window repair or maintenance. You have alternatives if your sashes are not suitable for refurbishing or reuse. We have millworkers and carpenters who work with us who can duplicate the original sash for you. However, unless you plan to install this window as a functioning window you probably do not need a regular sash. In place of a regular sash, we can provide you with a hardwood frame that will look more like that around a picture. These are special frames made for stained glass that look good from both sides of the panel. In the past, when it has not been possible to find or make good glass matches for repairs, we have even combined pieces from more than one panel to make one panel that is perfect. Regarding safety, not all old windows were made with lead matrices. For those that were, they are generally safe when they are displayed. However, when the lead starts being cut, torn and twisted such as when it is repaired or the window is restored, then they become unhealthy. What if the lead is old and crummy now? Is is unsafe to display that way? Any health risk from doing so is probably minimal. Just don't lick it and wash your hands well after handling it. If we can help you do anything to improve or display your antique windows, please contact David Wixon & Associates, Inc. We will enjoy seeing what you have, making suggestions about how you can enjoy your antique glass more and conducting any necessary repair, restoration or remodeling that may be necessary and appropriate.